Hampton Art Blog: Hi, Hello, Thinking of you cards! Have you ever looked at your stamps and have no plan? No idea what you’re going to make next? As I sat down to make this card I had no plan, no idea what I was going to do. So I picked up a few sets and landed on the Circle Bird set and an idea started to form. 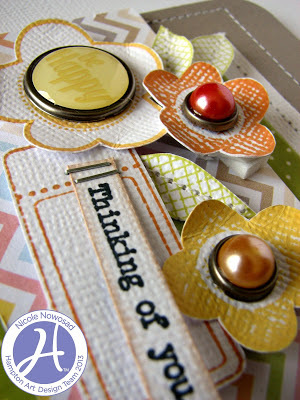 If you are every stuck or lost like was, look through your stamps and paper, you are bound to get inspired by something! Stamp floral background, start at bottom and work your way out then up. 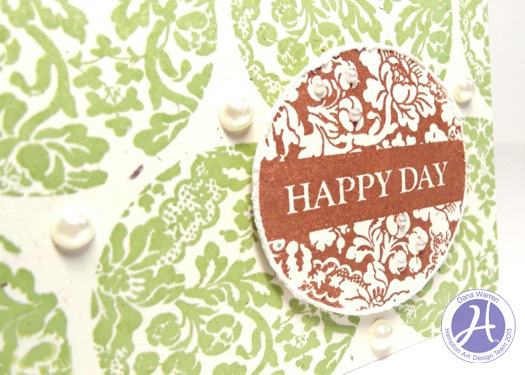 Adhere tiny pearls to Happy Day flowers and adhere circle to cardbase. 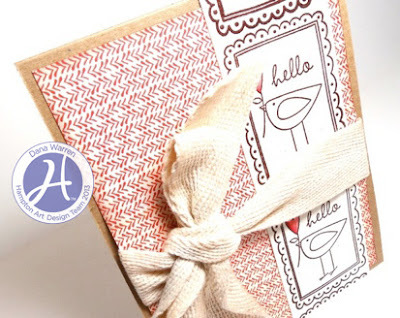 Today I have a sweet card to just say hello! It came together nicely and fast! I also used some twill tape that I got from some fabric napkins that I bought! Trim pattern paper and ink edges with Mudslide dye ink. Wrap twill tape around pattern paper, lightly distress with ink. Stamp and emboss images on cardstock. Color hearts with watercolors. Adhere stamped strip to panel. Adhere panel to cardbase. Hi, it’s Gini, and I’m here to share I bright and cheerful card, to get you in the mood for spring. The subtle background was created by randomly stamping the Doodlebug Sweet Background stamp on the kraft paper using Orchid pigment ink. 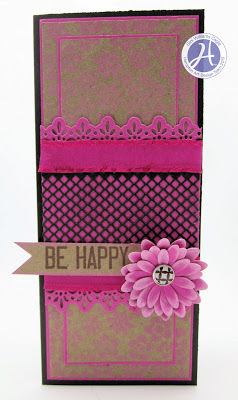 Cut two layers of kraft, and mat with 1/8” border of Shocking Pink cardstock. 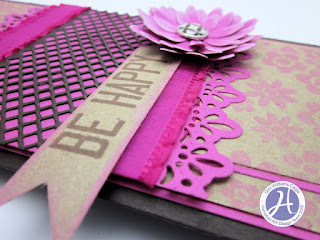 Stamp the floral background onto both pieces of the kraft paper using the Orchid ink. Diecut the mesh border from brown cardstock. Die cut the top and bottom edges of a piece of Shocking Pink cardstock, using the Lady Kate Edger. Mount the mesh border in the center. Add ribbon between the diecut edge and the center mesh. Cut flowers and ink with Jasmine ink. Shape and attach with a brad. Stamp the sentiment with the Chestnut Roan ink, hand cut into a pennant shape, and attach behind the flower. I love adding dimension to any project. For this card, I stamped a few flower images, and then curled the edges for a realistic feel. After I stamped the leaves, I added some machine stitching, before trimming them out of the paper. I love the layered look of the flower grouping, and the pennant sentiment on the tag. 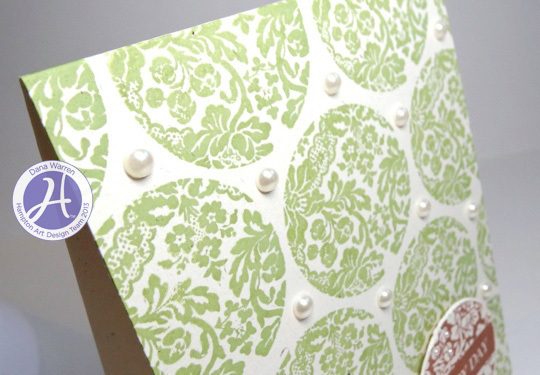 It adds a cute touch for a pretty card! wow! love these cards Ladies! They look amazing! !